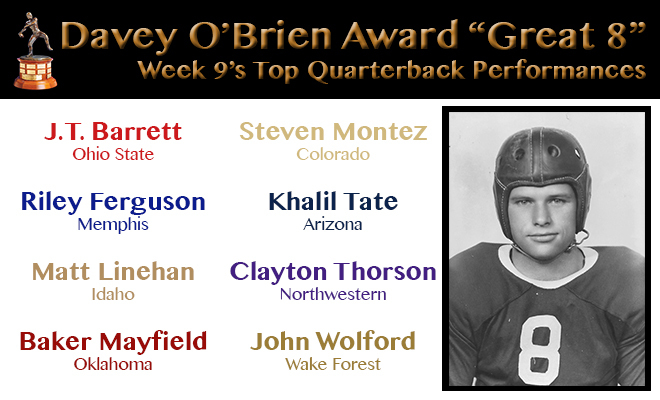 FORT WORTH, Texas (Oct. 30, 2017) – The Davey O’Brien Award’s “Great 8” list for week nine includes four newcomers to the weekly honor and a quartet that has combined to total 13 accolades this season. 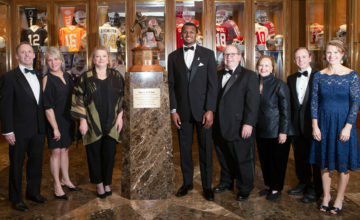 The eight honorees, as determined by voting from the award’s selection subcommittee, are: Ohio State’s J.T. Barrett, Riley Ferguson of Memphis, Idaho’s Matt Linehan, Baker Mayfield of Oklahoma, Colorado’s Steven Montez, Khalil Tate of Arizona, Northwestern’s Clayton Thorson and John Wolford of Wake Forest. Fifty-three different quarterbacks have now earned the 72 total honors through the season’s first nine weeks. 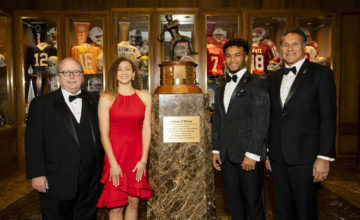 Mayfield becomes the first player in the nation honored four times this year, while Barrett, Ferguson and Tate are among just five who have been recognized on three occasions. 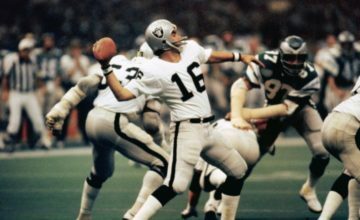 Led the Buckeyes back from an 18-point deficit with 423 total yards of offense (328 passing, 95 rushing) and four TD passes versus just six incompletions against No. 2 Penn State (39-38). Accounted for five touchdowns (three passing, two rushing) and was 18-of-31 throwing for 298 yards in the Tigers’ 56-26 win over Tulane. Matt Linehan, Idaho, Sr., 6-3, 239, Orchard Lake, Mich. Completed 28-of-42 pass attempts for a season-best 360 yards and three touchdowns with no interceptions in a 31-23 triumph over ULM. Totaled five touchdowns (four passing, one rushing) and was 22-for-34 passing for 281 yards in a 49-27 victory over Texas Tech. Threw for 347 yards on 20-of-26 passing and totaled four touchdowns (three passing, one rushing) as Colorado defeated Cal, 44-28. Had 421 total yards (275 passing, 146 rushing) and three total touchdowns (two passing, one rushing) in Arizona’s 58-37 victory over No. 15 Washington State. Clayton Thorson, Northwestern, Jr., 6-4, 225, Wheaton, Ill. Led Northwestern to a 39-31 triple-overtime win over No. 16 Michigan State by completing 33-of-48 attempts for 356 yards and two scores and rushing for a touchdown. John Wolford, Wake Forest, Sr., 6-1, 200, Jacksonville, Fla. Threw for a career-high 461 yards and five touchdowns against only six incompletions (28-of-34), and added a rushing score in a 42-32 win over Louisville.